↑ ୧.୦ ୧.୧ Christmas as a Multi-faith Festival—BBC News. Retrieved September 30, 2008. ↑ ୨.୦ ୨.୧ "In the U.S., Christmas Not Just for Christians". Gallup, Inc. December 24, 2008. Retrieved December 16, 2012. ↑ Gwynne, Paul (2011). World Religions in Practice. John Wiley & Sons. ISBN 978-1-4443-6005-9. ↑ ୪.୦ ୪.୧ Ramzy, John. "The Glorious Feast of Nativity: 7 January? 29 Kiahk? 25 December?". Coptic Orthodox Church Network. Retrieved January 17, 2011. ↑ Steinfels, Peter (January 6, 2007). "At Armenian Churches, a Distinct Observance Today". The New York Times. ↑ ୯.୦ ୯.୧ ୯.୨ Martindale, Cyril Charles."Christmas". The Catholic Encyclopedia. Vol. 3. New York: Robert Appleton Company, 1908. ↑ Forbes, Bruce David (October 1, 2008). Christmas: A Candid History. University of California Press. p. 27. ISBN 978-0-520-25802-0. In 567 the Council of Tours proclaimed that the entire period between Christmas and Epiphany should be considered part of the celebration, creating what became known as the twelve days of Christmas, or what the English called Christmastide. ↑ Senn, Frank C. (2012). Introduction to Christian Liturgy. Fortress Press. p. 145. ISBN 978-1-4514-2433-1. We noted above that late medieval calendars introduced a reduced three-day octave for Christmas, Easter, and Pentecost that were retained in Roman Catholic and passed into Lutheran and Anglican calendars. ↑ Ehorn, Lee Ellen; Hewlett, Shirely J.; Hewlett, Dale M. (September 1, 1995). December Holiday Customs. Lorenz Educational Press. p. 1. ISBN 978-1-4291-0896-6. ↑ Nick Hytrek, "Non-Christians focus on secular side of Christmas", Sioux City Journal, November 10, 2009. Retrieved November 18, 2009. ↑ Canadian Heritage – Public holidays – Government of Canada. Retrieved November 27, 2009. ↑ 2009 Federal Holidays – U.S. Office of Personnel Management. Retrieved November 27, 2009. ↑ Bank holidays and British Summer time – HM Government. Retrieved November 27, 2009. ↑ Corinna Laughlin, Michael R. Prendergast, Robert C. Rabe, Corinna Laughlin, Jill Maria Murdy, Therese Brown, Mary Patricia Storms, Ann E. Degenhard, Jill Maria Murdy, Ann E. Degenhard, Therese Brown, Robert C. Rabe, Mary Patricia Storms, Michael R. Prendergast, Sourcebook for Sundays, Seasons, and Weekdays 2011: The Almanac for Pastoral Liturgy, LiturgyTrainingPublications, 2010, p. 29. ↑ "The Chronography of 354 AD. Part 12: Commemorations of the Martyrs", The Tertullian Project. 2006. Retrieved November 24, 2011. ↑ Roll, Susan K., Toward the Origins of Christmas, (Peeters Publishers, 1995), p. 133. ↑ The Liturgical Year. Thomas Nelson. November 3, 2009. ISBN 978-1-4185-8073-5. Retrieved April 2, 2009. Christmas is not really about the celebration of a birth date at all. It is about the celebration of a birth. The fact of the date and the fact of the birth are two different things. The calendrical verification of the feast itself is not really that important ... What is important to the understanding of a life-changing moment is that it happened, not necessarily where or when it happened. The message is clear: Christmas is not about marking the actual birth date of Jesus. It is about the Incarnation of the One who became like us in all things but sin (Heb. 4:15) and who humbled Himself "to the point of death-even death on a cross" (Phil. 2:8). Christmas is a pinnacle feast, yes, but it is not the beginning of the liturgical year. It is a memorial, a remembrance, of the birth of Jesus, not really a celebration of the day itself. We remember that because the Jesus of history was born, the Resurrection of the Christ of faith could happen. ↑ "The Christmas Season". CRI / Voice, Institute. Retrieved April 2, 2009. The origins of the celebrations of Christmas and Epiphany, as well as the dates on which they are observed, are rooted deeply in the history of the early church. There has been much scholarly debate concerning the exact time of the year when Jesus was born, and even in what year he was born. Actually, we do not know either. The best estimate is that Jesus was probably born in the springtime, somewhere between the years of 6 and 4 BC, as December is in the middle of the cold rainy season in Bethlehem, when the sheep are kept inside and not on pasture as told in the Bible. The lack of a consistent system of timekeeping in the first century, mistakes in later calendars and calculations, and lack of historical details to cross reference events has led to this imprecision in fixing Jesus' birth. This suggests that the Christmas celebration is not an observance of a historical date, but a commemoration of the event in terms of worship. ↑ The School Journal, Volume 49. Harvard University. 1894. Retrieved April 2, 2009. 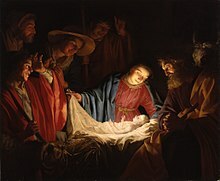 Throughout the Christian world the 25th of December is celebrated as the birthday of Jesus Christ. There was a time when the churches were not united regarding the date of the joyous event. Many Christians kept their Christmas in April, others in May, and still others at the close of September, till finally December 25 was agreed upon as the most appropriate date. The choice of that day was, of course, wholly arbitrary, for neither the exact date not the period of the year at which the birth of Christ occurred is known. For purposes of commemoration, however, it is unimportant whether the celebration shall fall or not at the precise anniversary of the joyous event. ↑ West's Federal Supplement. West Publishing Company. 1990. While the Washington and King birthdays are exclusively secular holidays, Christmas has both secular and religious aspects. ↑ Cyril Charles Martindale, "Christmas", in The Catholic Encyclopedia. Vol. 3, New York: Robert Appleton Company, 1908 (accessed December 21, 2012). ↑ Schoenborn, Christoph (1994). God's human face: the Christ-icon. p. 154. ISBN 0-89870-514-2. ↑ Galey, John (1986). Sinai and the Monastery of St. Catherine. p. 92. ISBN 977-424-118-5. ↑ ୩୬.୦ ୩୬.୧ "Christmas" in the Middle English Dictionary. ↑ Griffiths, Emma, "Why get cross about Xmas? ", BBC, December 22, 2004. Retrieved December 12, 2011. ↑ क्रिसमस को बड़ा दिन क्यों कहते हैं? ↑ ୩୯.୦ ୩୯.୧ Hutton, Ronald, The Stations of the Sun: A History of the Ritual Year, Oxford University Press, 2001. ↑ "Midwinter" in Bosworth & Toller. ↑ Yule, Online Etymology Dictionary. Retrieved December 12. ↑ Noel Online Etymology Dictionary. Retrieved December 12. ↑ "Biblical literature", Encyclopædia Britannica, 2011. Web. January 22, 2011. ↑ ୪୯.୦ ୪୯.୧ Rowell, Geoffrey (December 1993). "Dickens and the Construction of Christmas". History Today. 43 (12). Retrieved December 28, 2016. There is no doubt that A Christmas Carol is first and foremost a story concerned with the Christian gospel of liberation by the grace of God, and with incarnational religion which refuses to drive a wedge between the world of spirit and the world of matter. Both the Christmas dinners and the Christmas dinner-carriers are blessed; the cornucopia of Christmas food and feasting reflects both the goodness of creation and the joy of heaven. It is a significant sign of a shift in theological emphasis in the nineteenth century from a stress on the Atonement to a stress on the Incarnation, a stress which found outward and visible form in the sacramentalism of the Oxford Movement, the development of richer and more symbolic forms of worship, the building of neo-Gothic churches, and the revival and increasing centrality of the keeping of Christmas itself as a Christian festival. ... In the course of the century, under the influence of the Oxford Movement's concern for the better observance of Christian festivals, Christmas became more and more prominent. By the later part of the century cathedrals provided special services and musical events, and might have revived ancient special charities for the poor – though we must not forget the problems for large: parish-church cathedrals like Manchester, which on one Christmas Day had no less than eighty couples coming to be married (the signing of the registers lasted until four in the afternoon). The popularity of Dickens' A Christmas Carol played a significant part in the changing consciousness of Christmas and the way in which it was celebrated. The popularity of his public readings of the story is an indication of how much it resonated with the contemporary mood, and contributed to the increasing place of the Christmas celebration in both secular and religious ways that was firmly established by the end of the nineteenth century. Chisholm, Hugh, ed. (1911). "Christmas". Encyclopædia Britannica. 6 (Eleventh ed.). Cambridge University Press. pp. 293–294.